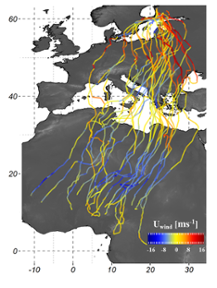 Migrant birds that breed in the same area in Europe spread out across all of Africa during the northern winter. A new satellite-tracking study shows that the destination of individual birds is largely determined by the wind conditions they encounter during their first migration. The results were made available open access in the peer-reviewed journal Proceedings of the Royal Society B.